When you are working on your big dream to be a female triathlete, fitness challenges can be a really fun way to test where you are at athletically compared to other endurance athletes and the run can break up the monotony of training. 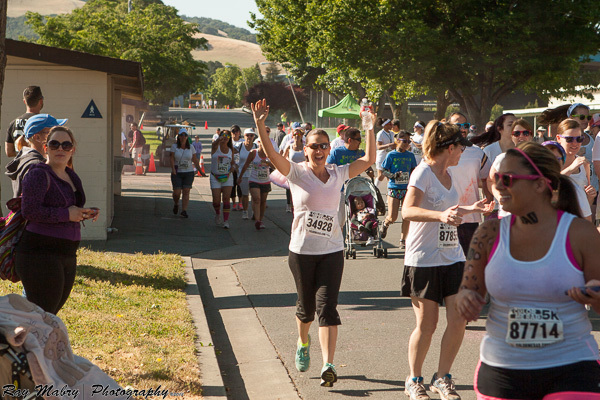 One great way to do this is to run in a unique fun run 5k race–which is only 3.1 miles. I am hoping this article will reveal some options you haven’t thought of and get you motivated to sign up for a themed 5k race. Why a 5k Themed Race for First Runs? Whether you are starting your triathlete dream as a walker, jogger or the running part is easy for you, a 5k fun run is a great place to try out a group event. And remember, 5k run equals 3.1 miles, so the distance is not overwhelming for walkers which short races encourage. Fun run themed races are usually not timed events. It only matters to you how fast you feel you need to finish. Themed runs are about the journey–not the destination. Your journey, should you decided to try a Color Run event is to run or walk the course while occasionally being pelted–in a nice way–by pigmented cornstarch and colored water. Each section of the run adds a new explosion of color to your clean, painter’s palate until you cross the finish line into a final blitzkrieg of color. You can forget speed, with a color run the one who is covered head to toe can claim to be the race winner. From the moment you walk on the grounds of a themed 5k race like Color Run the energy of the crowd will draw you in and motivate you to give this race all you’ve got. Pumping music and bouncing participants is often the first thing you see and hear at the race start gathering. Almost everyone is wearing theme-based exercise clothing. For my first Color Run, I actually bought a white T-shirt specifically for the event. I don’t typically own anything white, including a white T-shirt, because I am very good at staining my clothes. 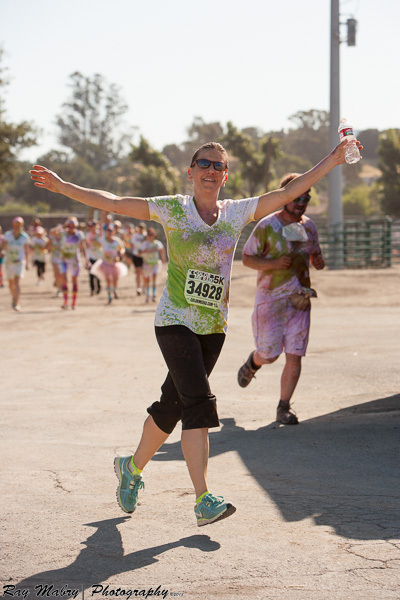 Ironic that the whole point of this run is to get as colorfully-stained as possible! There’s nothing like a group of excited people all in white jumping up to try and grab little bags of color with the intention of throwing it all over everyone. What, wait, what… we have to run? If you make it to the race start line still perfectly white you won’t be for long. Just a few minutes after the start of the race the first color bomb hits the runners. The huge cloud of color serves as a warning to the runners. Event volunteers toss handfuls of colored cornstarch as you pass by. If you time it just right, you’ll get a great splash of color. Each color bomb station has one color to adorn you. The first was my favorite–orange! I made sure to stroll through and spin around to get the most color impact. I love that every volunteer is full of encouragement and high fives as you run by–no matter what speed you are going. You Can Tell by THE COLOR RUN™ Be a Color Runner™ Official Videos that Color Run Races Have a Great Vibe. 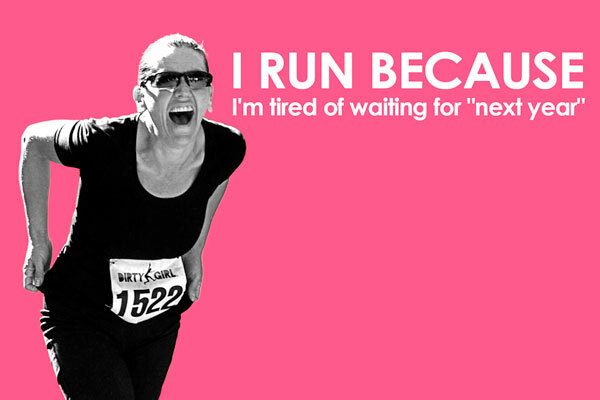 Are you wondering how you find out about future fun runs near you? Visit the site’s Ultimate Guide to 5K Races lists 5k runs. Visit the site’s Interesting and Fun Races Calander. Visit the site’s Event page. Races are featured on the Electric Run homepage. Visit the site’s Event Locations page. Races are featured on the BlackLightRun homepage. Visit the site’s Event Page for themed-races held at Disney Parks. Visit the site’s Locations page. What looks like fun for your 1st female triathlete practice 5k race? Make your triathlete dreams a reality!